For other uses, see Crazy Horse (disambiguation). A 1934 sketch of Crazy Horse made by a Mormon missionary after interviewing Crazy Horse's sister. She said it was accurate. Crazy Horse (the elder), also known as Waglula (Worm), Rattling Blanket Woman (born 1814). Crazy Horse (Lakota: Tȟašúŋke Witkó in Standard Lakota Orthography, IPA:tχaʃʊ̃kɛ witkɔ), literally "His-Horse-Is-Crazy"; ca. 1840 – September 5, 1877) was a Native American war leader of the Oglala Lakota. He took up arms against the U.S. Federal government to fight against encroachments on the territories and way of life of the Lakota people, including leading a war party to victory at the Battle of the Little Bighorn in June 1876. Four months after surrendering to U.S. troops under General Crook in May 1877, Crazy Horse was fatally wounded by a military guard, using his bayonet, while allegedly resisting imprisonment at Camp Robinson in present-day Nebraska. He ranks among the most notable and iconic of Native American tribal members and has been honored by the U.S. Postal Service with a 13¢ Great Americans series postage stamp. Crazy Horse and his band of Oglala on their way from Camp Sheridan to surrender to General Crook at Red Cloud Agency, Sunday, May 6, 1877 / Berghavy ; from sketches by Mr. Hottes. Sources differ on the precise year of Crazy Horse's birth, but they agree he was born between 1840 and 1845. According to a close friend, he and Crazy Horse "were both born in the same year at the same season of the year", which census records and other interviews place at about 1845. Encouraging Bear, an Oglala medicine man and spiritual adviser to the Oglala war leader, reported that Crazy Horse was born "in the year in which the band to which he belonged, the Oglala, stole One Hundred Horses, and in the fall of the year", a reference to the annual Lakota calendar or winter count. Among the Oglala winter counts, the stealing of 100 horses is noted by Cloud Shield, and possibly by American Horse and Red Horse owner, as equivalent to the year 1840-41. Oral history accounts from relatives on the Cheyenne River Reservation place his birth in the spring of 1840. On the evening of his son's death, the elder Crazy Horse told Lieutenant H. R. Lemly that his son "would soon have been thirty-seven, having been born on the South Cheyenne river in the fall of 1840". Crazy Horse was named at birth Cha-O-Ha ("In the Wilderness" or "Among the Trees", meaning he was one with nature.) His mother's nickname for him was "Curly" or "Light Hair"; as his light curly hair resembled that of his mother. Crazy Horse was born to parents from two tribes of the Lakota division of the Sioux, his father was an Oglala and his mother was a Miniconjou. His father, born in 1810, was also named Crazy Horse. One account said that after the son had reached maturity and shown his strength, his father gave him his name and took a new one, Waglula (Worm). (Another version of how the son Crazy Horse acquired his name was that he took it after having a vision.) His mother was Rattling Blanket Woman (born 1814). Crazy Horse's cousin (son of Lone Horn) was Touch the Clouds. He saved Crazy Horse's life at least once and was with him when he died. Rattling Blanket Woman was the daughter of Black Buffalo and White Cow (also known as Iron Cane). Her older siblings were Lone Horn (born 1790–1795, died 1875) and Good Looking Woman (born 1810). Her younger sister was named Looks At It (born 1815), later given the name They Are Afraid of Her. The historian George Hyde wrote that Rattling Blanket Woman was Miniconjou and the sister of Spotted Tail, who became a Brulé head chief. In the summer of 1844, "Waglula" (Worm) went on a buffalo hunt. He came across a Minneconjou Lakota village under attack by Crow warriors. He led his small party of warriors to the village and rescued it. Corn, the head man of the village, had lost his wife in the raid. In gratitude he gave Waglula his two eldest daughters as wives: Iron Between Horns (age 18) and Kills Enemy (age 17). Corn's youngest daughter, Red Leggins, who was 15 at the time, requested to go with her sisters; all became Waglula's wives. According to Frederick Hoxie's Encyclopedia of North American Indians(1996), Crazy Horse was the third in his male line to bear the name of Crazy Horse, which in Oglala is Tasunke Witko. Tasunke Witko III (1840–77) was the son of Rattling Blanket Woman and Tasunke Witko II. The love of his life was Black Buffalo Woman, whom he courted, but she married another man named No Water. At one point, Crazy Horse persuaded Black Buffalo Woman to run away with him. No Water borrowed a pistol and ran after his wife. When he found her with Crazy Horse, he fired at him, gravely injuring him in the face and leaving a noticeable scar. Crazy Horse was married two times: first to Black Shawl, and second to Nellie Larrabee (Laravie). Nellie Larrabee was assigned to spy on Crazy Horse for the military, so the "marriage" is suspect. Only Black Shawl bore him any children: a daughter named They Are Afraid of Her, who died at age three. Crazy Horse lived in the Lakota camp with his younger brother, High Horse (son of Iron Between Horns and Waglula) and a cousin Little Hawk. (Little Hawk was the nephew of his maternal step-grandfather, Corn.) The camp was entered by Lt. Grattan and 28 other US troopers, who intended to arrest a Minniconjou man for having stolen a cow (The cow had wandered into the camp, and after a short time someone butchered it and passed the meat out among the people). A conflict known as the Grattan massacre ensued and the Sioux killed the US Army forces. After having witnessed the death of the Lakota leader Conquering Bear, Crazy Horse began to get trance visions. His father Waglula took him to what today is Sylvan Lake, South Dakota, where they both sat to do a hemblecha or vision quest. A red-tailed hawk led them to their respective spots in the hills; as the trees are tall in the Black Hills, they could not always see where they were going. Crazy Horse sat between two humps at the top of a hill north and to the east of the lake. Waglula sat south of Harney Peak but north of his son. Crazy Horse's vision first took him to the South where, in Lakota spirituality, one goes upon death. He was brought back and was taken to the West in the direction of the wakiyans (thunder beings). He was given a medicine bundle to protect him for life. One of his animal protectors would be the white owl which, according to Lakota spirituality, would give extended life. He was also shown his "face paint" for battle, to consist of a yellow lightning bolt down the left side of his face, and white powder. He would wet this and put marks over his vulnerable areas; when dried, the marks looked like hailstones. His face paint was similar to that of his father, who used a red lightning strike down the right side of his face and three red hailstones on his forehead. Crazy Horse put no makeup on his forehead and did not wear a war bonnet. Lastly, he was given a sacred song that is still sung by the Oglala people today and he was told he would be a protector of his people. He was also shown his "face paint" for battle, to consist of a yellow lightning bolt down the left side of his face, and white powder. He would wet this and put marks over his vulnerable areas; when dried, the marks looked like hailstones. Black Elk, a contemporary and cousin of Crazy Horse, related the vision in Black Elk Speaks: Being the Life Story of a Holy Man of the Oglala Sioux, from talks with John G. Neihardt. When I was a man, my father told me something about that vision. Of course he did not know all of it; but he said that Crazy Horse dreamed and went into the world where there is nothing but the spirits of all things. That is the real world that is behind this one, and everything we see here is something like a shadow from that world. He was on his horse in that world, and the horse and himself on it and the trees and the grass and the stones and everything were made of spirit, and nothing was hard, and everything seemed to float. His horse was standing still there, and yet it danced around like a horse made only of shadow, and that is how he got his name, which does not mean that his horse was crazy or wild, but that in his vision it danced around in that queer way. It was this vision that gave him his great power, for when he went into a fight, he had only to think of that world to be in it again, so that he could go through anything and not be hurt. Until he was killed at the Soldiers' Town on White River, he was wounded only twice, once by accident and both times by some one of his own people when he was not expecting trouble and was not thinking; never by an enemy. </blockquote> Crazy Horse received a black stone from a medicine man named Horn Chips to protect his horse, a black-and-white pinto he named Inyan (rock or stone). He placed the stone behind the horse's ear so that the medicine from his vision quest and Horn Chips would combine—he and his horse would be one in battle. Through the late 1850s and early 1860s, Crazy Horse's reputation as a warrior grew, as did his fame among the Lakota. The Lakota told accounts of him in their oral histories. His first kill was a Shoshone raider who had murdered a Lakota woman washing buffalo meat along the Powder River. Crazy Horse fought in numerous battles between the Lakota and their traditional enemies, the Crow, Shoshone, Pawnee, Blackfeet, and Arikara, among Plains tribes. In 1864, after the Third Colorado Cavalry decimated Cheyenne and Arapaho in the Sand Creek Massacre, Lakota Oglala and Minneconjou bands allied with them against the US military. Crazy Horse was present at the Battle of Platte Bridge and the Battle of Red Buttes in July 1865. Because of his fighting ability, in 1865 Crazy Horse was named a Ogle Tanka Un (Shirt Wearer, or war leader) by the tribe. On December 21, 1866, Crazy Horse and six other warriors, both Lakota and Cheyenne, decoyed Capt. William Fetterman's 53 infantrymen and 27 cavalry troopers under Lt. Grummond into an ambush. They had been sent out from Fort Phil Kearny to follow up on an earlier attack on a wood train. Crazy Horse lured Fetterman's infantry up a hill. Grummond's cavalry followed the other six decoys along Peno Head Ridge and down toward Peno Creek, where several Cheyenne women taunted the soldiers. Meanwhile, Cheyenne leader Little Wolf and his warriors, who had been hiding on the opposite side of Peno Head Ridge, blocked the return route to the fort. The Lakota warriors swept over the hill and attacked the infantry. Additional Cheyenne and Lakota hiding in the buckbrush along Peno Creek effectively surrounded the soldiers. Seeing that they were surrounded, Grummond headed his cavalry back to Fetterman. The combined warrior forces of nearly 1,000 killed all the US soldiers, in what became known at the time to the white population as the Fetterman Massacre. It was the Army's worst defeat on the Great Plains up to that time. The Lakota and Cheyenne call it the Battle of the Hundred in the Hand. On August 2, 1867, Crazy Horse participated in the Wagon Box Fight, also near Fort Phil Kearny. Lakota forces numbering between 1000 and 2000 attacked a wood-cutting crew near the fort. Most of the soldiers fled to a circle of wagon boxes without wheels, using them for cover as they fired at the Lakota. The Lakota took substantial losses, as the soldiers were firing new breech-loading rifles. These could fire ten times a minute compared to the old muzzle-loading rate of three times a minute. The Lakota charged after the soldiers fired the first time, expecting the delay of their older muskets before being able to fire again. The soldiers suffered only five killed and two wounded, while the Lakota suffered between 50 and 120 casualties. Many Lakota were buried in the hills surrounding Fort Phil Kearny in Wyoming. In the fall of 1867, Crazy Horse invited Black Buffalo Woman to accompany him on a buffalo hunt in the Slim Buttes area of present-day northwestern South Dakota. She was the wife of No Water, who had a reputation for drinking too much. It was Lakota custom to allow a woman to divorce her husband at any time. She did so by moving in with relatives or with another man, or by placing the husband's belongings outside their lodge. Although some compensation might be required to smooth over hurt feelings, the rejected husband was expected to accept his wife's decision. No Water was away from camp when Crazy Horse and Black Buffalo Woman left for the buffalo hunt. No Water tracked down Crazy Horse and Black Buffalo Woman in the Slim Buttes area. When he found them in a tipi, he called Crazy Horse's name from outside. When Crazy Horse answered, No Water stuck a pistol into the tipi and aimed for Crazy Horse. Touch the Clouds, Crazy Horse's first cousin and son of Lone Horn, was sitting in the tipi nearest the entry. He knocked the pistol upward as No Water fired, deflecting the bullet to Crazy Horse's upper jaw. No Water left, with Crazy Horse's relatives in hot pursuit. No Water ran his horse until it died and continued on foot until he reached the safety of his own village. Several elders convinced Crazy Horse and No Water that no more blood should be shed. As compensation for the shooting, No Water gave Crazy Horse three horses. Because Crazy Horse was with a married man's wife, he was stripped of his title as Shirt Wearer (leader). 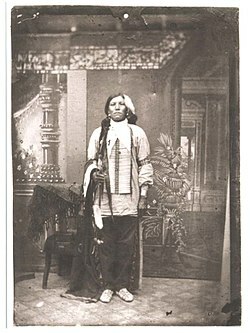 Crazy Horse married Black Shawl, a member of the Oglala Lakota and relative of Spotted Tail. The elders sent her to heal Crazy Horse after his altercation with No Water. Crazy Horse and Black Shawl Woman were married in 1871. Black Shawl gave birth to Crazy Horse's only child, a daughter named They Are Afraid Of Her, who died in 1873. Black Shawl outlived Crazy Horse. She died in 1927 during the influenza outbreaks of the 1920s. "Red Cloud also arranged to send a young woman to live in Crazy Horse's lodge. Interpreter William Garnett described (Nellie Larrabee) as "a half-blood, not of the best frontier variety, an invidious and evil woman." Nellie, also referred to as Chi-Chi and Brown Eyes Woman, was the daughter of a French trader and a Cheyenne woman. Garnett's first-hand account of Crazy Horse's surrender alludes to Nellie as the "half blood woman" who caused Crazy Horse to fall into a "domestic trap which insensibly led him by gradual steps to his destruction". On June 17, 1876, Crazy Horse led a combined group of approximately 1,500 Lakota and Cheyenne in a surprise attack against brevetted Brigadier General George Crook's force of 1,000 cavalry and infantry, and allied 300 Crow and Shoshone warriors in the Battle of the Rosebud. The battle, although not substantial in terms of human losses, delayed Crook's joining with the 7th Cavalry under George A. Custer. It contributed to Custer’s subsequent defeat at the Battle of the Little Bighorn. A week later at 3:00 p.m. on June 25, 1876, Custer's 7th Cavalry attacked a large encampment of Cheyenne and Lakota bands along the Little Bighorn River, marking the beginning of his last battle. Crazy Horse's actions during the battle are unknown. Hunkpapa warriors led by Chief Gall led the main body of the attack. Crazy Horse's tactical and leadership role in the battle remains ambiguous. While some historians think that Crazy Horse led a flanking assault, ensuring the death of Custer and his men, the only proven fact is that Crazy Horse was a major participant in the battle. His personal courage was attested to by several eye-witness Indian accounts. Water Man, one of only five Arapaho warriors who fought, said Crazy Horse "was the bravest man I ever saw. He rode closest to the soldiers, yelling to his warriors. All the soldiers were shooting at him, but he was never hit." Sioux battle participant, Little Soldier, said, "The greatest fighter in the whole battle was Crazy Horse." On September 10, 1876, Captain Anson Mills and two battalions of the Third Cavalry captured a Miniconjou village of 36 tipis in the Battle of Slim Buttes, South Dakota. Crazy Horse and his followers attempted to rescue the camp and its headman, (Old Man) American Horse but they were unsuccessful. The soldiers killed American Horse and much of his family after they holed up in a cave for several hours. On January 8, 1877, Crazy Horse's warriors fought their last major battle at Wolf Mountain, against the US Cavalry in the Montana Territory. His people struggled through the winter, weakened by hunger and the long cold. Crazy Horse decided to surrender with his band to protect them, and went to Fort Robinson in Nebraska. The Last Sun Dance of 1877 is significant in Lakota history as the Sun Dance held to honor Crazy Horse one year after the victory at the Battle of the Little Big Horn, and to offer prayers for him in the trying times ahead. Crazy Horse attended the Sun Dance as the honored guest but did not take part in the dancing. Five warrior cousins sacrificed blood and flesh for Crazy Horse at the Last Sun Dance of 1887. The five warrior cousins were three brothers, Flying Hawk, Kicking Bear and Black Fox II, all sons of Chief Black Fox, also known as Great Kicking Bear, and two other cousins, Eagle Thunder and Walking Eagle. The five warrior cousins were braves considered vigorous battle men of distinction. Crazy Horse and other northern Oglala leaders arrived at the Red Cloud Agency, located near Fort Robinson, Nebraska, on May 5, 1877. Together with He Dog, Little Big Man, Iron Crow and others, they met in a solemn ceremony with First Lieutenant William P. Clark as the first step in their formal surrender. For the next four months, Crazy Horse resided in his village near the Red Cloud Agency. The attention that Crazy Horse received from the Army drew the jealousy of Red Cloud and Spotted Tail, two Lakota who had long before come to the agencies and adopted the white ways. Rumors of Crazy Horse's desire to slip away and return to the old ways of life started to spread at the Red Cloud and Spotted Tail agencies. In August 1877, officers at Camp Robinson received word that the Nez Perce of Chief Joseph had broken out of their reservation in Idaho and were fleeing north through Montana toward Canada. When asked by Lieutenant Clark to join the Army against the Nez Perce, Crazy Horse and the Miniconjou leader Touch the Clouds objected, saying that they had promised to remain at peace when they surrendered. According to one version of events, Crazy Horse finally agreed, saying that he would fight "till all the Nez Perce were killed". But his words were apparently misinterpreted by a half-Tahitian scout, Frank Grouard (not be confused with Fred Gerard, another U.S. Cavalry scout during the summer of 1876), who reported that Crazy Horse had said that he would "go north and fight until not a white man is left". When he was challenged over his interpretation, Grouard left the council. Another interpreter, William Garnett, was brought in but quickly noted the growing tension. With the growing trouble at the Red Cloud Agency, General George Crook was ordered to stop at Fort Robinson. A council of the Oglala leadership was called, then canceled, when Crook was incorrectly informed that Crazy Horse had said the previous evening that he intended to kill the general during the proceedings. Crook ordered Crazy Horse's arrest and then departed, leaving the military action to the post commander at Fort Robinson, Lieutenant Colonel Luther P. Bradley. Additional troops were brought in from Fort Laramie. On the morning of September 4, 1877, two columns moved against Crazy Horse's village, only to find that it had scattered during the night. Crazy Horse fled to the nearby Spotted Tail Agency with his sick wife (who had become ill with tuberculosis). After meeting with military officials at the adjacent military post of Camp Sheridan, Crazy Horse agreed to return to Fort Robinson with Lieutenant Jesse M. Lee, the Indian agent at Spotted Tail. On the morning of September 5, 1877, Crazy Horse and Lieutenant Lee, accompanied by Touch the Clouds as well as a number of Indian scouts, departed for Fort Robinson. Arriving that evening outside the adjutant's office, Lieutenant Lee was informed that he was to turn Crazy Horse over to the Officer of the Day. Lee protested and hurried to Bradley's quarters to debate the issue, but without success. Bradley had received orders that Crazy Horse was to be arrested and taken under the cover of darkness to Division Headquarters. Lee turned the Oglala war chief over to Captain James Kennington, in charge of the post guard, who accompanied Crazy Horse to the post guardhouse. Once inside, Crazy Horse struggled with the guard and Little Big Man and attempted to escape. Just outside the door, Crazy Horse was stabbed with a bayonet by one of the members of the guard. He was taken to the adjutant's office, where he was tended by the assistant post surgeon at the post, Dr. Valentine McGillycuddy, and died late that night. The following morning, Crazy Horse's body was turned over to his elderly parents; they took it to Camp Sheridan and placed it on a burial scaffold. The following month, when the Spotted Tail Agency was moved to the Missouri River, Crazy Horse's parents moved the remains to an undisclosed location. There are at least four possible locations as noted on a state highway memorial near Wounded Knee, South Dakota. His final resting place remains unknown. A monument dedicated to Crazy Horse's memory. Dr. McGillycuddy, who treated Crazy Horse after he was stabbed, wrote that Crazy Horse "died about midnight". According to military records, he died before midnight, making it September 5, 1877. John Gregory Bourke's memoir of his service in the Indian wars, On the Border with Crook, describes a different account of Crazy Horse's death. He based his account on an interview with Crazy Horse's relative and rival, Little Big Man, who was present at Crazy Horse's arrest and wounding. The interview took place over a year after Crazy Horse's death. Little Big Man said that, as Crazy Horse was being escorted to the guardhouse, he suddenly pulled two knives from under his blanket and held one in each hand. One knife was reportedly fashioned from an army bayonet. Little Big Man, standing behind him, seized Crazy Horse by both elbows, pulling his arms up behind him. As Crazy Horse struggled, Little Big Man lost his grip on one elbow, and Crazy Horse drove his own knife deep into his own lower back. The guard stabbed Crazy Horse with his bayonet in the back. The chief fell and surrendered to the guards. When Bourke asked about the popular account of the guard bayoneting Crazy Horse first, Little Big Man said that the guard had thrust with his bayonet, but that Crazy Horse's struggles resulted in the guard's thrust missing entirely and lodging his bayonet into the frame of the guardhouse door. Little Big Man said that in the hours immediately following Crazy Horse's wounding, the camp commander had suggested the story of the guard's being responsible to hide Little Big Man's role in the death of Crazy Horse and avoid any inter-clan reprisals. Little Big Man's account is questionable; it is the only one of 17 eyewitness sources from Lakota, US Army, and "mixed-blood" individuals, that fails to attribute Crazy Horse's death to a soldier at the guardhouse. The author Thomas Powers cites various witnesses who said Crazy Horse was fatally wounded when his back was pierced by a guard's bayonet. The identity of the soldier responsible for the bayoneting of Crazy Horse is also debatable. Only one eyewitness account actually identifies the soldier as Private William Gentles. Historian Walter M. Camp circulated copies of this account to individuals who had been present who questioned the identity of the soldier and provided two additional names. To this day, the identification remains questionable. Most sources question whether Crazy Horse was ever photographed. Dr. McGillycuddy doubted any photograph of the war leader had been taken. In 1908, Walter Camp wrote to the agent for the Pine Ridge Reservation inquiring about a portrait. "I have never seen a photo of Crazy Horse," Agent Brennan replied, "nor am I able to find any one among our Sioux here who remembers having seen a picture of him. Crazy Horse had left the hostiles but a short time before he was killed and it's more than likely he never had a picture taken of himself." In 1956, a small tintype portrait purportedly of Crazy Horse was published by J. W. Vaughn in his book With Crook at the Rosebud. The photograph had belonged to the family of the scout, Baptiste "Little Bat" Garnier. Two decades later, the portrait was published with further details about how the photograph was produced at Fort Robinson, though the editor of the book "remained unconvinced of the authenticity of the photograph". Recently, the original tintype was on exhibit at the Custer Battlefield Museum in Garryowen, Montana. The museum says that it is the only authentic portrait of Crazy Horse. Historians continue to dispute the identification. Experts argue that the tintype was taken a decade or two after 1877. The evidence includes the individual's attire (such as the length of the hair pipe breastplate and the ascot tie). In addition, no other photograph with the same painted backdrop has been found. Several photographers passed through Fort Robinson and the Red Cloud Agency in 1877—including James H. Hamilton, Charles Howard, David Rodocker and possibly Daniel S. Mitchell—but none used the backdrop that appears in the tintype. After the death of Crazy Horse, Private Charles Howard produced at least two images of the famed war leader's alleged scaffold grave, located near Camp Sheridan, Nebraska. The image of Crazy Horse at the top of this page was made in 1934 by a forensic artist from a description given by Crazy Horse's sister. This drawing belongs to Crazy Horse's family, and has been publicly shown only once, on the PBS program History Detectives. "Even the most basic outline of his life shows how great he was, because he remained himself from the moment of his birth to the moment he died; because he knew exactly where he wanted to live, and never left; because he may have surrendered, but he was never defeated in battle; because, although he was killed, even the Army admitted he was never captured; because he was so free that he didn't know what a jail looked like. His dislike of the oncoming civilization was prophetic. He never met the President, never rode on a train, slept in a boarding house, or ate at a table and unlike many people all over the world, when he met white men he was not diminished by the encounter." In the view of author Chris Hedges, "there are few resistance figures in American history as noble as Crazy Horse", while adding that "his ferocity of spirit remains a guiding light for all who seek lives of defiance." Crazy Horse is commemorated by the incomplete Crazy Horse Memorial in the Black Hills of South Dakota near the town of Berne—a monument carved into a mountain, in the tradition of the Mount Rushmore National Memorial (on which Korczak Ziółkowski had worked with Gutzon Borglum). The sculpture was begun by Ziółkowski in 1948. Plans call for the completed monument to be 641 feet (195 m) wide and 563 feet (172 m) high. Crazy Horse has also been honored by having two highways named the Crazy Horse Memorial Highway. In South Dakota, the SDDOT designated US-16/US-385 between Custer and Hill City, which passes by the Crazy Horse Memorial. In November 2010, Nebraska Governor Dave Heineman approved designating US-20 from Hay Springs to Fort Robinson in honor of Crazy Horse, capping a year-long effort by citizens of Chadron. The designation may extend east another 100 miles through Cherry County to Valentine. In 1924, Crazy Horse Monument sculptor Korczak Ziolkowski had worked under master sculptor Gutzon Borglum on the Mount Rushmore memorial. Ziolkowski was inspired to create the Crazy Horse Monument after receiving a letter from native Indian Chief Henry Standing Bear, who asked if Ziolkowski would be interested in creating a monument for the native North Americans to show that the Indian nations also have their heroes. The Native Americans consider Thunderhead Mountain, where the monument is being carved, to be sacred ground. Thunderhead Mountain is situated between Custer City and Hill City. The location of Crazy Horse Monument is about 8 miles away from Mount Rushmore. The finished dimensions of the Crazy Horse memorial are expected to be approximately 641 feet (195 meters) wide and 563 feet (172 meters) tall. When the Crazy Horse Monument is finished, the head of Chief Crazy Horse will be the world’s largest sculpture of the human head measuring approximately 87 feet (27 meters) tall, more than 27 feet taller than the 60-foot faces of the US Presidents carved in the side of Mount Rushmore. Upon completion, the Chief Crazy Horse Monument will be the largest sculpture in the world. The blasting continues and the memorial is a work in progress, dependent upon donations and private funding only. Although the US Government has offered to help fund the construction of the Chief Crazy Horse Monument on several occasions, Ziokowski and his successors have declined. Since Ziokowski's death in 1982, the project has been under the direction of the non-profit Crazy Horse Memorial Foundation, which has chosen to honor Ziokowski's intention of aiming for higher educational and cultural goals by keeping the funding of the project private. With the help of the foundation the work continues and is overseen by Ziolkowski's wife, Ruth, and their 10 children. There is no target completion date at this time; however, in 1998, the face of Crazy Horse was completed and dedicated. The Crazy Horse Memorial Foundation regularly takes the lead in cultural, social and educational events, including the Volksmarch, the occasion on which the public is allowed into the actual monument grounds. Visitors and enthusiasts of this event have grown to 15,000 annually. The foundation generates most of its funds from its visitor fees, with visitors numbering more than a million yearly. The Crazy Horse South Dakota monument has been the subject of controversy. The sculpted likeness of Chief Crazy Horse is dedicated to the spirit of Crazy Horse and all Native Americans. It is well known that Crazy Horse did not want to be photographed during his lifetime and is reportedly buried in an undisclosed location. While Lakota Chief Henry Standing Bear believed in the sincerity of the motives, many Native Americans are still against this memorial. Some of the people who knew the history of Crazy Horse likened the monument to pollution and desecration of the landscape and environment of the national park and its vicinity. ↑ Salter Reynolds, Susan (December 26, 2010). "Book review: 'The Killing of Crazy Horse' by Thomas Powers". Los Angeles Times. http://articles.latimes.com/2010/dec/26/entertainment/la-ca-thomas-powers-20101226. Retrieved October 30, 2013. ↑ "George Kills in Sight Describes the Death of Indian Leader Crazy Horse". History Matters. George Mason University. ↑ He Dog interview, July 7, 1930, in: Eleanor H. Hinman (ed. ), "Oglala Sources on the Life of Crazy Horse", Nebraska History 57 (Spring 1976) p. 9. ↑ Chips Interview, February 14, 1907, in: Richard E. Jensen (ed. ), The Indian Interviews of Eli S. Ricker, 1903–1919 (Lincoln: University of Nebraska Press, 2005) p. 273. ↑ Cloud Shield count, in: Garrick Mallery, Pictographs of the North American Indians, 4th Annual Report, Bureau of American Ethnology (Washington, D.C.: Government Printing Office, 1886) p. 140. Richard G. Hardorff, "Stole-One-Hundred-Horses Winter: The Year the Oglala Crazy Horse was Born", Research Review, vol. 1 no. 1 (June 1987) pp. 44–47. ↑ 9.0 9.1 9.2 9.3 9.4 9.5 9.6 9.7 The Authorized Biography of Crazy Horse and His Family Part One: Creation, Spirituality, and the Family Tree, DVD William Matson and Mark Frethem, Producers. (Reelcontact.com Productions, 2006). ↑ Lemly, "The Death of Crazy Horse", New York Sun, September 14, 1877. ↑ Hyde, George (1974). Spotted Tail's Folk: A History of the Brulé Sioux. Civilization of the American Indian. 57 (2 ed.). Norman, OK: University of Oklahoma Press. p. 15. ISBN 978-0-8061-1380-7. ↑ 12.0 12.1 12.2 12.3 12.4 12.5 12.6 12.7 12.8 12.9 The Authorized Biography of Crazy Horse and His Family Part Two: Defending the Homeland Prior to the 1868 Treaty, DVD William Matson and Mark Frethem, Producers. Reelcontact.com Productions, 2007. ↑ "Fetterman Massacre". Encyclopædia Britannica-Online. ↑ . Joseph M. Marshall III, The Journey of Crazy Horse, Penguin Books 2004. ↑ Richard G. Hardoff (ed.). Lakota Recollections, University of Nebraska Press, 1997, p.30 n.16. ↑ Edward Kadlecek and Mabell Kadlecek, To Kill An Eagle: Indian Views on the Last Days of Crazy Horse, 1981, p.40. ↑ "Young Black Fox was the half brother of Kicking Bear and Flying Hawk. On September 4, 1877, Young Black Fox commanded Crazy Horse's warriors in his absence. The courage displayed on that occasion earned him the respect of both Indians and whites alike. In the same year Young Black Fox sought sanctuary in Canada, but he was killed on his return to the United States in 1881 by Indians of an enemy tribe." See McCreight, Firewater and Forked Tongues: A Sioux Chief Interprets U.S. History, (1947), p.4. ↑ Kadlecek,p.143. Also, see Kingsley M. Bray, Crazy Horse: A Lakota Life, 2006, P.314. ↑ DeBarthe, Joe. Account by Frank Grouard of Crazy Horse, Life and Adventures of Frank Grouard, University of Oklahoma Press, 1958, p.53–54; at Astonisher.com. ↑ Powers, Thomas (2010). The Killing of Crazy Horse. New York: Knopf. pp. 415–416. ISBN 978-0-375-41446-6. ↑ "Crazy Horse: Who Really Wielded the Bayonet that Killed The Oglala Leader? ", Greasy Grass, May 12, 1996, pp. 2–10. ↑ Brennan to Camp, undated (probably December 1908), Camp Collection, Little Bighorn Battlefield National Monument. ↑ Friswold, Carroll. The Killing of Crazy Horse, Glendale, CA: A. H. Clark Co., 1976; reprinted Lincoln, NE: University of Nebraska Press, 1988. ↑ Buecker, Tom. "The Search for the Elusive (and Improbable) Photo of Famous Oglala Chief", Greasy Grass May 14, 1998. ↑ Heriard, Jack. 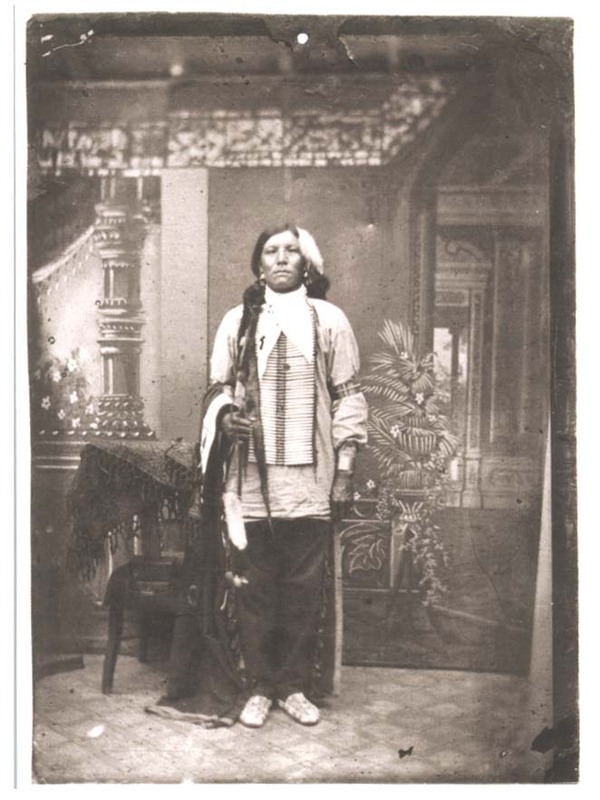 "Debating Crazy Horse: Is this the photo of the famous Oglala? ", Whispering Wind Magazine, vol. 34 no. 3 (2004) pp. 16–23. ↑ Dickson, Ephriam D. III. "Crazy Horse's Grave: A Photograph by Private Charles Howard, 1877", Little Big Horn Associates Newsletter vol. XL no. 1 (February 2006) pp. 4–5. ↑ Dickson, Ephriam D. III. "Capturing the Lakota Spirit: Photographers at the Red Cloud and Spotted Tail Agencies", Nebraska History, vol. 88 no. 1 & 2 (Spring–Summer 2007) pp. 2–25. ↑ Rempp, Kerri (November 17, 2010). "Nebraska highway to be named for Lakota leader". Rapid City Journal. http://rapidcityjournal.com/news/article_67ad4e6e-f264-11df-9d09-001cc4c002e0.html. Retrieved March 23, 2012. ↑ 37.0 37.1 Nell Jessup Newton, “Memory And Misrepresentation: Representing Crazy Horse” Connecticut Law Review (1995): 1003. Wikimedia Commons has media related to Crazy Horse. "Crazy Horse". Oglala (Lakota) Sioux Indian War Leader. Find a Grave. April 16, 1999. http://www.findagrave.com/memorial/5139. Retrieved November 26, 2012.